The new “chamber vehicle” provided by Warsaw Buick GMC Chrysler in Warsaw. 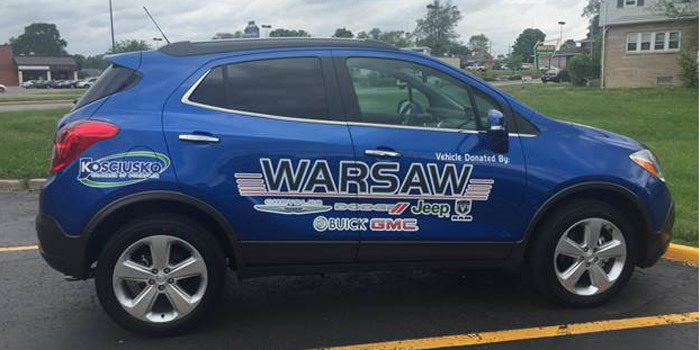 Warsaw Buick GMC Chrysler has partnered with the Kosciusko Chamber of Commerce by providing the new “Chamber Vehicle.” The chamber vehicle is a 2015 Buick Encore in brilliant blue. You may see it around Kosciusko County at events and various member locations. The Encore has 4G LTE connection with WiFi hotspot capability as well as 7-inch touchscreen that provides smartphone app integration. It also has special features like the rear camera, moon roof and much more. Warsaw Buick GMC Chrysler strives to make buying or leasing a new vehicle a pleasant and rewarding experience. Their service department is ready to serve customers from routine maintenance to major repairs. They are located at 2777 N. Detroit St., Warsaw. You can find out more at www.warsawbuickgmcchrysler.com. Kosciusko Chamber of Commerce connects business with opportunity by being the advocate of business in stimulating economic growth and diversity, promoting educational excellence and coordinating action on issues of community importance. For more information visit www.kchamber.com.